Rabbi Mendy Lipskier offers ritual circumcision according to the highest orthodox standards and traditions. 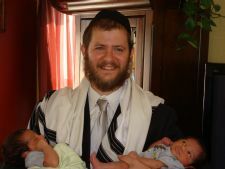 He trained under the leading Mohel in all of Jerusalem, Rabbi Chaim Moshe Veisberg, official Mohel of Sharei Tzedek Hospital where he received internship and training, and he is experienced in all areas of circumcision. A member of the International Bris Association.